What kind of vehicle would a speed-crazed toad drive? 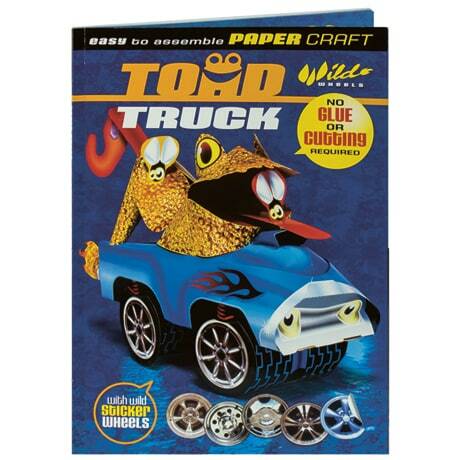 A "toad truck," of course. Build this hot-rod tow truck in shiny blue or "toad skin" paint schemes with your choice of seven wheel styles, then adjust your ride height (jacked up to the sky or down in the weeds) and add license plates and painted flames. Open and close the frog's mouth, and pull the tow hook to watch him snap up a fly. Yum! This paper model kit for readers 8 to 11 includes accessories like different eyes and "smoke and flame" effects—just punch out the die-cut pieces and follow the step-by-step instructions (no glue or cutting required) and you're ready to roll.